Weave Got Keys | Nerd Much? As it stands right now, my keyring is attached to an old WildStar lanyard I was given at PAX East two years ago. I don’t even play WildStar anymore, and haven’t for almost a year — I think it’s safe to say that it’s time to upgrade, which is why I have my eye on the Weave Got Keys, a carabiner key holder that neatly organizes your keys. 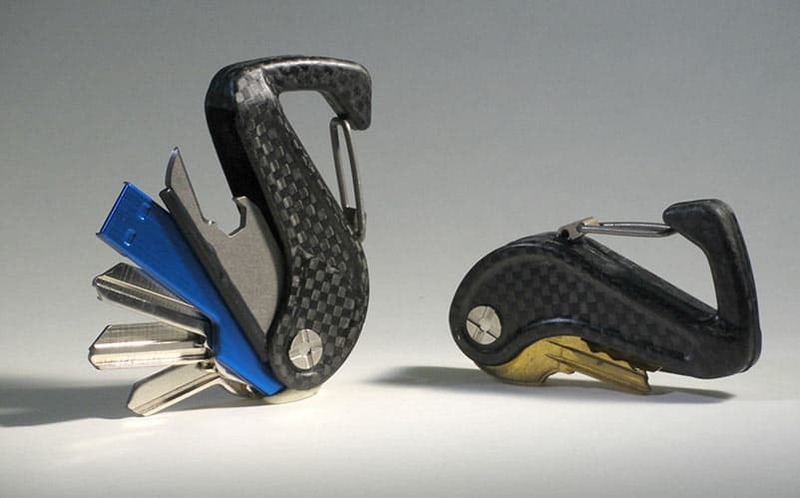 The Weave Got Keys carabiner is made up from carbon fiber and titanium, so it’s ultra lightweight and strong, but also stylish. It can be attached to your belt loop or thrown into your pocket. Regardless of the way you choose to carry it, your keys are much more organized and compact than they would be if they were on a keyring. It holds five keys, and includes an opener multi-tool that includes a 1/4″ HEX bit holder, a ferrocerium rod to help you start fires on the go, a box opener and can opener. Most importantly, you won’t risk scratching your phone or any other electronic device you put in your pocket. It’s currently available on Kickstarter for an early backer price of $50. For more cool stuff to buy, stay tuned to Nerd Much for daily finds.